The Spanish conquistadors first encountered the potato when they arrived in Peru in 1532 in search of gold, and noted Inca miners eating chuñu. At the time the Spaniards failed to realize that the potato represented a far more important treasure than either silver or gold, but they did gradually begin to use potatoes as basic rations aboard their ships. After the arrival of the potato in Spain in 1570, a few Spanish farmers began to cultivate them on a small scale, mostly as food for livestock. From Spain, potatoes slowly spread to Italy and other European countries during the late 1500s. By 1600, the potato had entered Spain, Italy, Austria, Belgium, Holland, France, Switzerland, England, Germany, Portugal and Ireland. But it did not receive a warm welcome. Throughout Europe, potatoes were regarded with suspicion, distaste and fear. Generally considered to be unfit for human consumption, they were used only as animal fodder and sustenance for the starving. In northern Europe, potatoes were primarily grown in botanical gardens as an exotic novelty. Even peasants refused to eat from a plant that produced ugly, misshapen tubers and that had come from a heathen civilization. Some felt that the potato plant's resemblance to plants in the nightshade family hinted that it was the creation of witches or devils. Frederick the Great of Prussia saw the potato's potential to help feed his nation and lower the price of bread, but faced the challenge of overcoming the people's prejudice against the plant. When he issued a 1774 order for his subjects to grow potatoes as protection against famine, the town of Kolberg replied: "The things have neither smell nor taste, not even the dogs will eat them, so what use are they to us?" Trying a less direct approach to encourage his subjects to begin planting potatoes, Frederick used a bit of reverse psychology: he planted a royal field of potato plants and stationed a heavy guard to protect this field from thieves. Nearby peasants naturally assumed that anything worth guarding was worth stealing, and so snuck into the field and snatched the plants for their home gardens. Of course, this was entirely in line with Frederick's wishes. Wash potatoes and quarter, place in large pot and cover with salted water. Cook until fork tender. Drain well. In microwave safe bowl, add butter, salt, parsley and dill, melt butter. Pour over top of potatoes and gently stir, making sure all potatoes are coated. Add more parsley, if desired. Serve warm. Enjoy! This sounds really good. It would be a great substitute for potato salad with mayo on a hot day at a BBQ. Wow, I never knew so much about potatoes!!! Thanks for sharing. Very interesting story. Thanks for the information! I can't imagine life without potatoes. What a great side dish! I love these potatoes they sound unbelieveably good! I appreciate the fact you include essays and information, rather than just photos of recipes. Thank you for your thoughtful blog posts. Hi everyone, I love potatoes. I also couldn't live without potatoes. Very interesting information, the potato is quite ugly, isn't it? Tasty though! And I don't use dill very much, think I should, so thanks for this recipe! Now, I know more about potatoes. This recipe is so easy to do and definitely will make this for my next potato dish. Thanks for the new potato recipe! I needed a new idea for sure. And thanks for the history, fun stuff! Yum! I need to try this sometime as we love potatoes. The dill must taste fabulous on them. 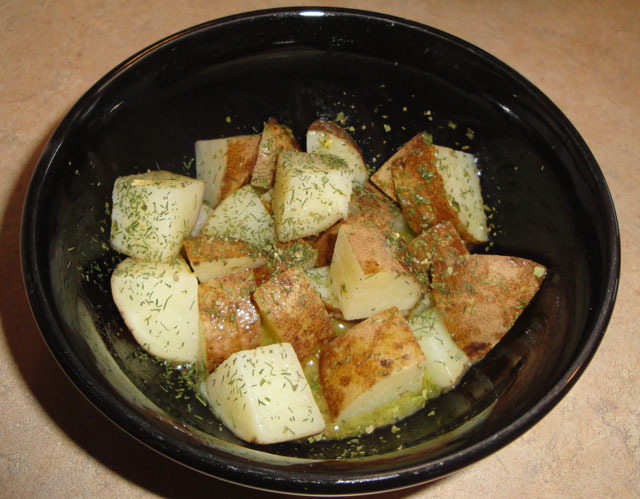 The dill taste great on the potatoes. Love it! I agree with you I love potatoes and your dilly potatos really make it.